Beginning with the prototype of the Virgin sitting on a throne, David develops a new subject with Mary and Jesus in a landscape, resting during their Flight from Egypt. This became a much-repeated subject. 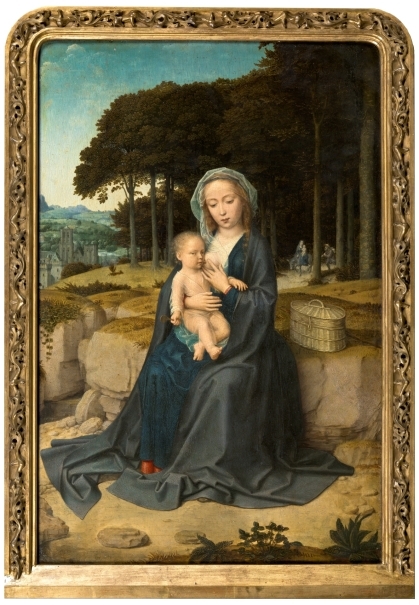 The influence of Renaissance art, especially Leonardo, is visible here, notably in the use of sfumato and the atmospheric variations of the background. It also appears in the placement of Mary in the center, creating a pyramid with her body, which stands out over the dark niche created by the trees. 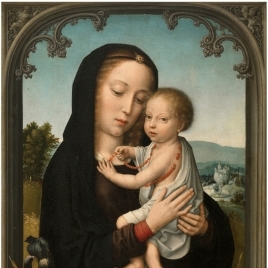 And just there, in the background on the right, we can see a tiny depiction of the Holy Family on its way to Egypt. Height: 60 cm. ; Width: 39 cm.